Make Money Online Reviews Can Traffic Authority’s Claims Be Believed? Can Traffic Authority’s Claims Be Believed? Traffic Authority (TA) is an online income product created and offered by Greg Chambers, Doug Wellens and Chad Stalvey. The product claims that you will easily make $10,000/month by downloading this system and its included video trainings. You also make money by recommending TA to others. There are three parts to TA: Tools, video training and affiliate plan. These tools are available for you to use once you purchase a basic membership subscription at $47/month. Social media marketing- You’re taught how to place Twitter and Facebook ads for TA, and to private message people with TA offers, etc. Email marketing- You learn how to email your subscriber list with TA offers, and how to buy and use email Solo ads. Buying traffic- TA tells you how to purchase traffic packages through its platform or those of its affiliates. Contacting leaders and influencers- TA advises that you contact other businesses in your area and pitch them TA and its resources. Email and phone scripts are provided. This additional training is available to you if you upgrade your membership package and pay $97/month. Finally, there is the TA affiliate plan, which focuses on marketing TA’s tools and traffic packages to others. If you purchase individual training tools and/or the traffic packages, you can sell them to others as an affiliate. As for the traffic packages themselves, there are six subscriptions in total, and they vary in price from $220 to $4,297. Yep, you read that correctly: The most expensive traffic package, called the Titanium, is priced at over four big ones. 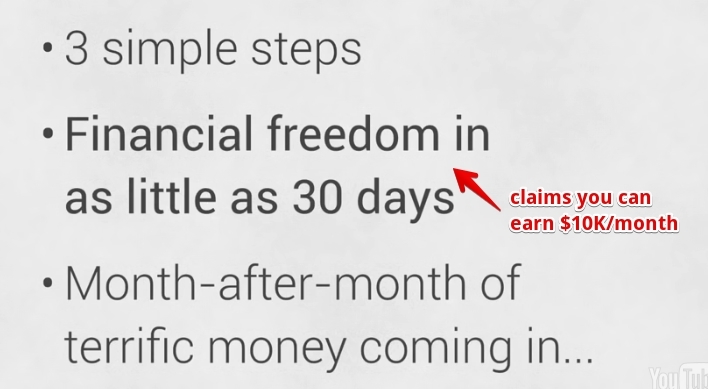 TA promises that by following just three simple steps, you can make loads of cash every month. However, the question remains: Is enrolling in TA worth the time and money? TA is all about peddling traffic products. The biggest money-making venue for TA is the affiliates who sell TA traffic products to other potential affiliates. As a result, much of the TA training is devoted to first convincing you to buy its products, and then to sell those products to others. It’s not that you can’t use the traffic generators for your own private label or affiliate products…but after shelling out over $4K for the top level traffic product, your natural focus will be on making that money back through affiliate sales. You must buy the products. TA goes on and on about how cheap it is, and how the true cost of this system is actually almost $2K. TA also claims how you’ll be making piles of money through its basic membership plan; however, your real income is defined by those high-priced traffic products that cost up to $4K. Unfortunately, you can’t just peddle TA products in a vacuum- you need to also be a customer. Which means that, naturally, whoever recommended you to TA will make a healthy commission from your purchase(s). TA is a rehash of other online income schemes. TA’s creators are also the masterminds behind products such as Infinite Leverage Systems (ILS) and CPC Broker (which redirects to Push Button Profits). The online reviews posted about these systems accuse them of being scams, or at the very least, shady MLM schemes. The product makeup and affiliate commissions surrounding ILS are nearly identical to those of TA, by the way. Incidentally, ILS is no longer operational- so all the people that shelled out thousands of dollars to be in that program have lost out on their investments. So, how much do you want to bet that TA is simply a reinvented (i.e., online reputation scrubbed) ILS? I understand that, as an affiliate, I must know how to create and launch a sales page, place online ads, and email my prospects with offers. However, this assumes that my prospects are warm leads and have a reason to go check out my offers. That warming up is typically paved with quality content that includes pillar articles, white papers, tutorials, podcasts, etc. Unfortunately, content creation is brushed over in TA trainings and the focus is almost entirely on sending ads and offers out to the general public and subscribers. If all you do is spam your audience with ads, you’ll be quickly unfriended and unsubscribed from- and that’s if Google doesn’t catch you first and de-index your website. And let’s not forget how you could get in trouble for violating the CAN-SPAM Act. Traffic Authority is a gamble that should be avoided. When an unproven affiliate program has you investing thousands of dollars in it before you see any of its promised returns, its claims should be taken with a grain of salt. The fact that TA relies almost exclusively on member recruitment also has my suspicions raised that it’s another MLM-style scheme. You are best advised to steer clear of TA and/or go with a program that doesn’t require such a massive investment.